When I think of golf, words like tedious and frustrating come into my mind. These are also examples of words I do not think of when playing Super Stickman Golf 2 (SSG2). If you’ve played a golf video game before, then the controls in SSG2 will be familiar. 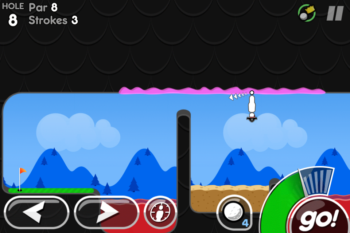 You aim with the arrow buttons and set swing power by tapping the power meter. There are 180 holes (or mazes really) divided into 20 course with sand traps, water hazards, moving platforms and many other obstacles to to test your skills. However, to help you along there are power ups, such as the Mulligan that allows you to redo a stroke, and hats, such as the Turtle Shell that slows down the power meter. There are also online and local Bluetooth/Wifi multiplier modes, where you can race your friends to the pin or play a more traditional turn-based game. I really enjoyed playing SSG2. Each hole gave me a unique maze filled with obstacles to overcome, so I was never bored and always challenged. Also, I see a lot of replay value in SSG2, as earning a gold star on a course required me to end with a score of -10, but I’d never get that score if I was also trying to collect all the dollars at the same time. 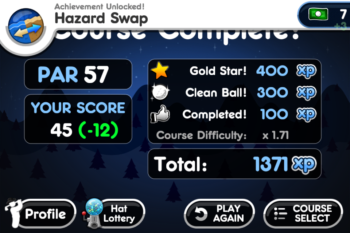 I had to play through a course at least twice to clear it. 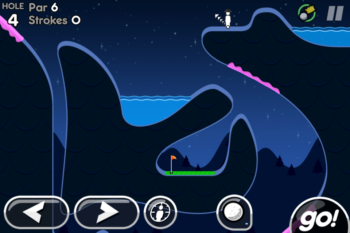 If you’re looking for a challenging puzzle game you can download Super Stickman Golf 2 for $2.99 from the App Store here. 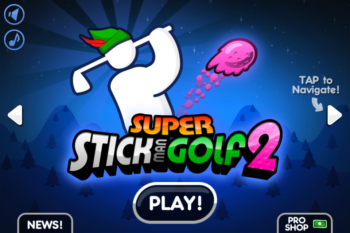 Then, tell us if you prefer golf or Super Stickman Golf 2.